After the most recent stage in the Pilgrimage of Trust in the Italian capital, it is time to share some impressions. Of course, the most important aspects are invisible, because they are inward: the seeds of trust and of hope that have been sown and which will perhaps grow in different ways. But let us stop for a moment with a few words and happenings that are worth recalling. Very important in this regard was the prayer vigil I celebrated about a month ago in this square with thousands of young people from all over Europe and with the ecumenical community of Taizé: a moment of grace in which we experienced the beauty of forming one in Christ. I encourage everyone to pray together so that we may achieve “what the Lord requires of us” (cf. Mic 6:6-8), as the theme of the Week this year says. The theme was suggested by several Christian communities in India, who invite the faithful as brothers and sisters in Christ, to work hard to achieve visible unity among Christians, and to overcome every type of unjust discrimination. It was a great pleasure to participate in the common prayer on the 29th December in St Peter’s Square with Pope Benedict XVI and thousands of young people from all over the world. Hearing these thousands of people singing together was like the joy of heaven on earth. And the time of silence was so impressive! Following the Meeting, the brothers and young people of the preparation teams visited all the parishes and Christian communities of Rome which hosted participants during the Meeting. During these visits, those who had opened their doors were full of thankfulness. Certain parents mentioned that their children had at first been less than enthusiastic about the idea of welcoming unknown young adults at home – a feeling which quite disappeared as soon as hosts and guests began to get to know each other. Thousands of people opened their doors to young people whom they did not know, in a period when people are often afraid of strangers: for Christians this highlights the communion of the Church and for everyone it helps to deepen understanding between peoples. Hospitality is a gesture that allows all to become bearers of peace in society. 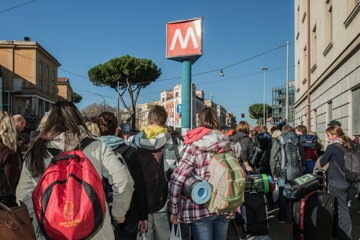 Before they left, so many young people expressed to us their gratitude for the days they spent in Rome. Even those who slept in collective accommodation found joy in being together, in helping each other in the simplicity of this pilgrimage. 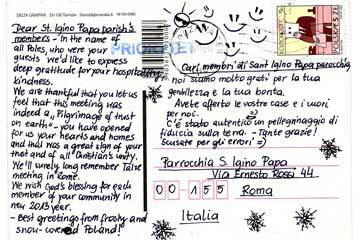 As for Marta, from Lower Silesia, Poland – she highlighted in particular the experience of “The Church as community” which the meeting represented, for her. 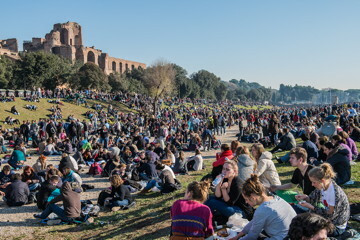 A large group of 150 young people from Strasbourg was present in Rome. The announcement that the next meeting would be held in Alsace and Baden was welcomed joyfully. During the past weeks, fifty places to stay with families have already been offered, to welcome the young people during the next meeting. This is an encouraging beginning! The list given here is not exhaustive but, rather, cites the articles or reports worthy of interest for those who would like to know more. The Italian television station RAI dedicated one report to the meeting, as did the French TV stations TF1 and KTO. In the Netherlands, there was the Catholic/Protestant TV programme. On the radio, the network of French-speaking Christian radio stations offered several broadcasts direct from Rome. The prayer at St Peter’s Square can be watched online. Finally, several articles were written about the Pilgrimage of Trust: in Italian in Città Nuova and Avvenire, an editorial in English published by Vatican Radio about ‘Youth and Ecumenism’, an article in the French daily paper La Croix: “Taizé fait vivre l’œcuménisme dans les églises de Rome” and also an account written in Polish about the Festival of Nations on December 31st. “We all came to Rome as pilgrims. We are all on the way towards a more personal communion with God and towards a deeper communion with each other. At Rome the young people discovered traces of the continuity of the faith from the time of the apostles to that of today. Coming from different nations, from a variety of Christian denominations, they were also able to deepen their solidarity, at a time in history when material difficulties – on the contrary – encourage a retreat into personal identity.